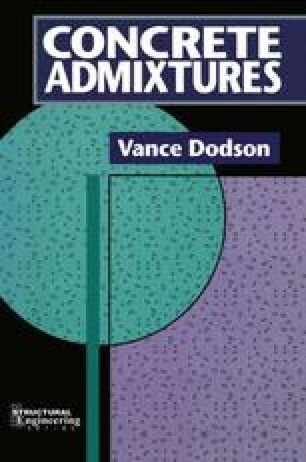 A set retarding admixture is defined as one that delays the time of setting of portland cement paste and hence that of its mixtures, such as mortars and concrete . Consequences of this delay in the rate of hardening, or setting, include a delay in the development of the early strength of the concrete, mortar, or paste and an increase in later compressive strength of the respective cementitious masses. There are three types of retarding admixtures recognized by ASTM: Type B, which simply retards the hydration of the portland cement; Type D, which not only retards the hydration but also acts to disperse the cement and thereby provide water reduction; and finally Type G, which is a high range water reducing and set retarding admixture  . Some of the physical properties of concrete, specified by ASTM, treated with the three types of chemical set retarding admixtures have been previously listed in Table 2–1 (p. 24) .